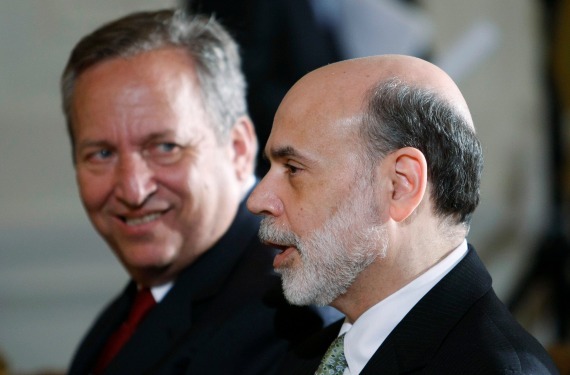 Larry Summers Withdraws for Fed Chair—Now What? Senate Democrats killed the Larry Summers quasi-candidacy. Will Janet Yellen now become our first female Fed Chair? We don't know who the next Fed Chair will be, but we know who it won't. It won't be Obama favorite -- and liberal bête noire -- Larry Summers, who officially withdrew his name from consideration on Sunday. It's just the latest plot twist in what has to be the nerdiest, and certainly most consequential, reality show ever: America's Next Top Central Banker. So how did we get here, and where are we headed now? The Summers quasi-candidacy was a bit strange from the beginning. Strange that the administration never actually nominated him, but rather let his trial balloon die a death of a thousand pinpricks. And strange that Summers -- who for all his brilliance lacked any relevant central banking or research experience -- was the frontrunner to begin with. Now, I don't want to overstate this last part. It wasn't strange that Summers was on the short list -- he could and would have been a fine Fed Chair. But it was a little strange that he was ahead of the more obviously qualified Fed number two Janet Yellen. As Ezra Klein explains, it wasn't about policy per se as much as Obama's extreme preference for keeping the economy in the hands of people he'd already worked with. And then the politics happened. Now, it's no secret that liberal Democrats don't like Summers. But neither do some not-so-liberal Democrats. Take your pick why. He was a gung-ho deregulator during the 1990s, consulted for Citigroup and hedge funds during the 2000s, and made some, at best impolitic, remarks about women and science during his Harvard presidency. These critics didn't really care that he had changed his tune on regulation (not quite a come-to-Jesus moment, but close enough) or that he'd never actually worked on Wall Street or that he had a long history of promoting women. Two Democrats on the Senate Banking Committee -- the first hurdle in the confirmation process -- publicly said that they would oppose Summers. Then, last Friday, Montana Senator Jon Tester made it three. With Massachusetts Senator Elizabeth Warren also harboring "serious concerns" about him, Summers might have needed four Republican votes just to get out of committee. That would have been a heavy political lift -- too heavy when the administration was focusing its attention on Syria and the upcoming budget battles. Summers realized as much, and, to his credit, made the tough (but correct) decision to bow out. So, it has to be Yellen, now, right? Probably. Obama has long wanted Tim Geithner for Fed Chair for the same reason he wanted Larry Summers -- as a familiar economic face -- but Geithner has ruled himself out, and reiterated that on Sunday. Obama has also mentioned longtime Fed hand Don Kohn as a candidate, but he would get plenty of scrutiny for his deregulatory past as Alan Greenspan's lieutenant. As a history-making choice who also happens to have the best C.V., Yellen would be an easy political win for an administration that needs one -- which is why the New York Times' John Harwood expects her to be nominated in the next few weeks. Markets certainly hope so. Stocks shot up about 1 percent globally on the news that Summers would not be the next Fed Chair, and the hope that Yellen would be. This, courtesy of the Financial Times, is not the headline you want to see when you withdraw your name for Fed Chair. 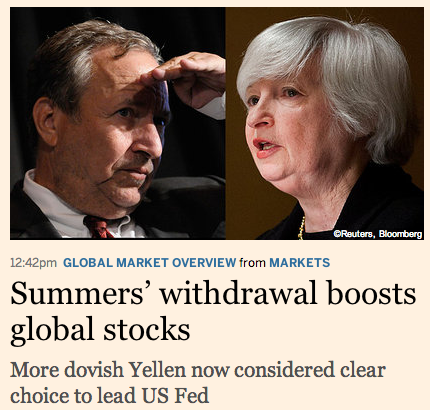 There was always this myth that Summers was Wall Street's candidate and Yellen was not. Summers might have been an easier regulator, but markets were worried he wouldn't set easier policy; if anything, the reverse. As Neil Irwin of Wonkblog points out, markets now think there's a 36 percent chance the Fed will hike rates by December 2014 compared to a 56 percent chance last Friday. That's the Summers effect -- or the Yellen effect, depending on how you look at it. Indeed, as the architect of the Fed's unconventional policies, she's not likely to exit them anytime soon. That's good news for Wall Street, and, hopefully, good news for everyone else too. Like all other Americans, Obama does the right thing after Senate Democrats exhaust all other possibilities for him.